Tax deduction at the source (TDS) is one of the ways to collect taxes based on certain percentages on the amount to be paid by the recipient for goods/services. The tax collected is an income for the government. 1. Who could deduct the TDS under the GST Act? The people or categories of people that can be notified by the government. An authority or council or other body created by the Parliament or by a state legislature or government, with a 51% (controlling) shareholding held by the government. A company constituted by the central government or by a state government or by a local authority and the company is registered under the Companies Registration Act 1860. 2. When is the responsibility for the deduction of TDS drawn? What is the TDS rate? The TDS must be deducted at the rate of 2% on payments made to the supplier of taxable goods and/or services, in which the total value of this supply, on the basis of an individual contract, exceeds Rs 2,50,000. No tax deduction is required where the supplier's position and place of supply are different from those of the recipient. 3. What are the registration requirements for TDS Deduction? 4.Where and to whom should the TDS be paid? 5. The issue of TDS certificates under the GST law? As in Income Tax Law, here also the person deducting tax has to issue the TDS certificate in form GSTR-7A to the concerned person within 5 days of depositing the tax to the government. Failure to do so will make the person liable to pay a late fee of Rs. 100 per day up to a maximum of Rs. 5000. 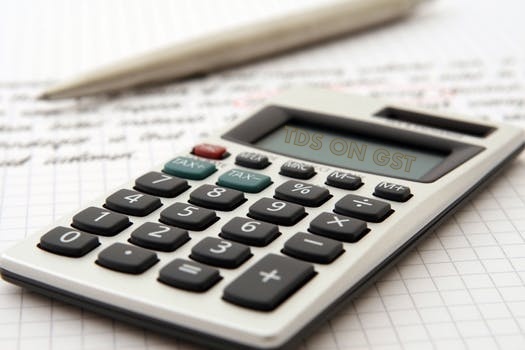 As in Income Tax Law, here additionally the individual deducting charge needs to issue the TDS testament in shape GSTR-7A to the concerned individual inside 5 long periods of keeping the assessment to the administration. Inability to do as such will make the individual subject to pay a late expense of Rs. 100 every day up to a most extreme of Rs. 5000. 6. 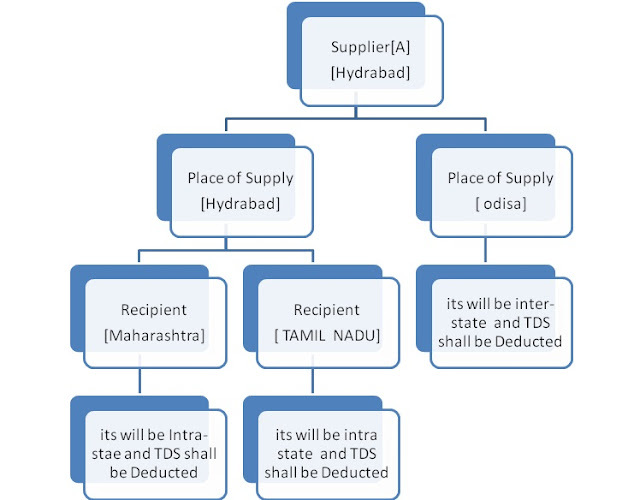 How much the Value of supply on which TDS shall be deducted? For purpose of deduction of TDS, the value of supply is to be taken as the amount excluding the tax on the invoice. This means TDS shall not be deducted on the GST component of invoice. Example:- Supplier RAM makes a supply worth Rs. 5000 to RAMA. The rate of GST is 18%. When RAMA pays A, She will pay Rs. 5000 (worth of Supply) + Rs 900 (GST) to RAM and Rs. 100 (RS. 5000*2%) as TDS to the government. So it show that TDS is not deducted on the tax(GST) of a transaction. 7. Which form is required to file the TDS return? The person deducting tax is required to file a TDS return in form GSTR-7 within 10 days from the end of the month. When GSTIN of the unregistered supplier is not available in this case name can be mentioned on it.system reflects these filled-in details in the electronic ledger of the supplier. 8. What is the benefit of TDS to the deductee? The deductee can claim credit in his electronic cash ledger of this tax deducted and use it for payments of other taxes. 9. How is Refund of TDS possible under GST?